After our morning tour of the LBJ Boyhood Home, Johnson Settlement, and Visitor Center in Johnson City, Donna and I headed west to Stonewall, the site of the LBJ Ranch and the Texas White House. 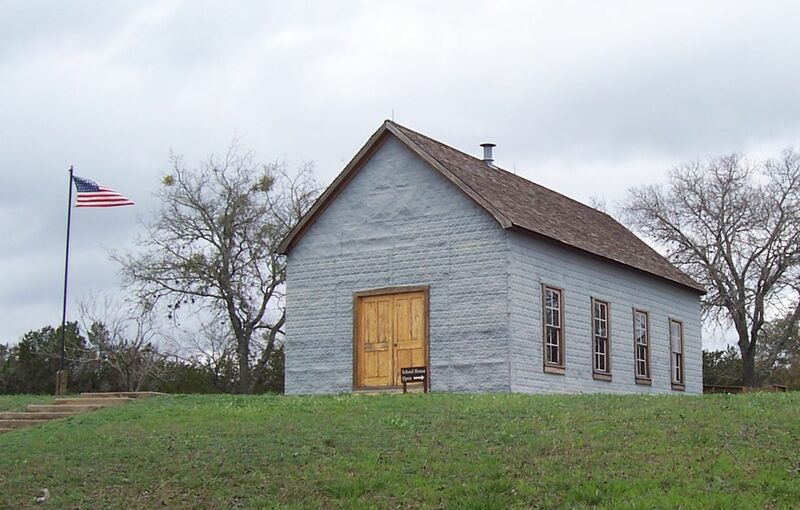 The Lyndon B. Johnson State Park and Historic Site is located on US 290 in Stonewall, Texas. As in Johnson City, there is also a Visitor Center here with displays and exhibits. 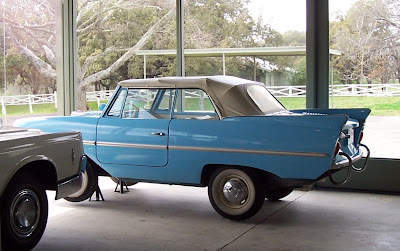 It is also the place to begin the driving tour. At the Visitor Center, you get a driving tour pass to allow you on the ranch grounds. You also receive a CD to play. Be sure to play the CD as it provides great information about the tour as you drive along. 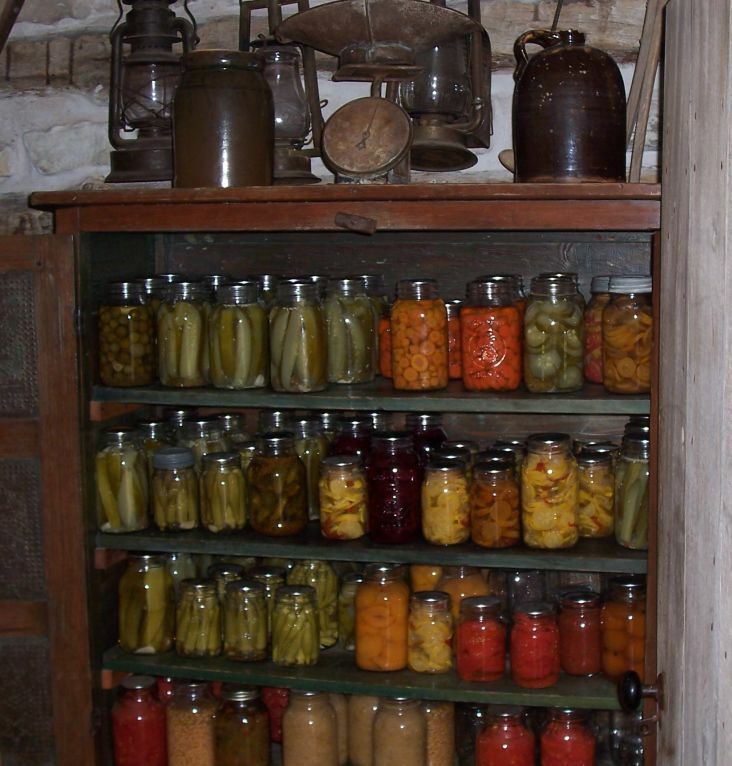 From the Visitor Center, you can tour the Sauer-Beckman Farmstead, which is a homestead maintained as in 1918. The volunteers and employees actually conduct themselves as if they live here, including eating their meals from food products raised on the farm. 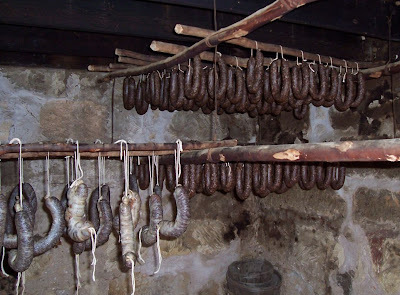 They had recently butchered a hog to make sausage, which they were currently smoking. 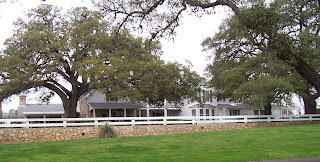 Donna and I both agreed that our favorite part of the day was the tour of the Johnson Ranch and the Texas White House. 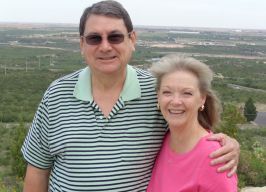 For years when driving through the area on our way back and forth between West Texas and Conroe, Donna and I have often taken Ranch Road 1, which veers off US 290 and follows the Pedernales River for a few miles. 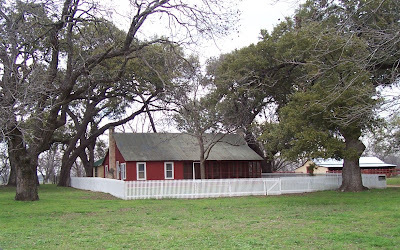 The little road is a pretty drive, affording beautiful views of the river, the oak and pecan trees, and the Johnson Ranch. We often commented that we needed to stop and tour the ranch, but we were always in a hurry. We aren't in a hurry anymore; time to tour the ranch. The tour begins on Ranch Road 1. At Klein Road, turn north, cross the river, then immediately turn west and view the old Junction School, a one-room school house where LBJ learned to read. This is also the place where he signed the Elementary and Secondary Education Act as President in 1965. 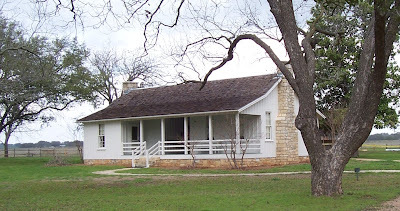 A bit farther down the road is the recreated birthplace of LBJ. The President was born at this site August 27, 1908. In 1964, he rebuilt the house as a guest house. 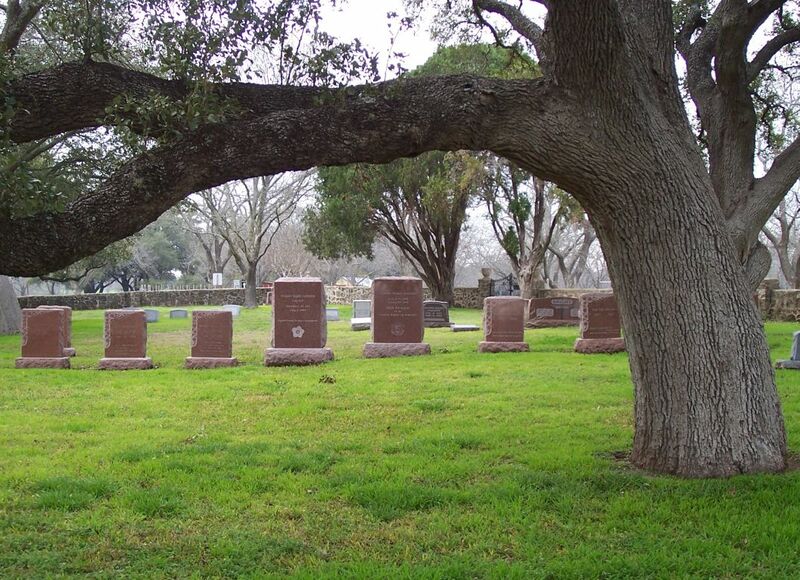 Right across the road from the birthplace is the Johnson family cemetery. It is a peaceful, tree covered patch of ground on the banks of the Pedernales River, with a Lutheran Church in the background. LBJ, Lady Bird, and many other Johnsons rest here. It's a good place to spend eternity. 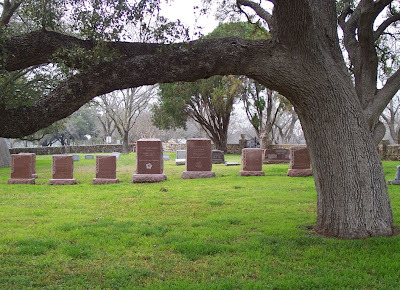 Johnson Family Cemetery. 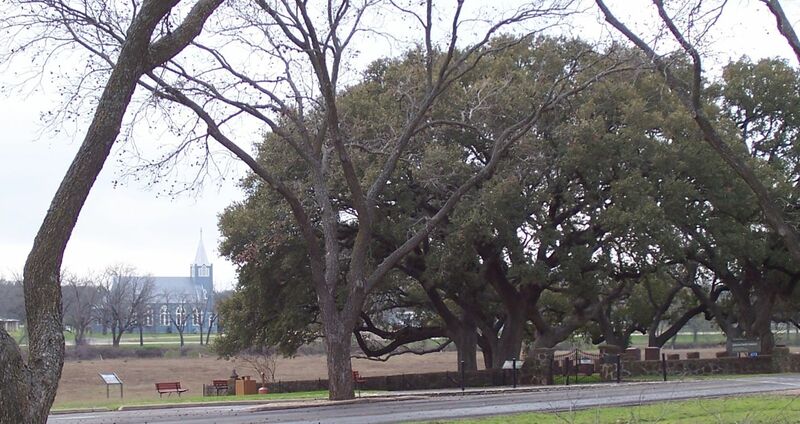 Just beyond, the Pedernales River (not visible), Ranch Road 1, and the Lutheran Church. A bit farther down the road is the final home of Sam and Eliza Johnson, the President's grandparents. They left the Settlement in Johnson City to live out the final years of their lives here. 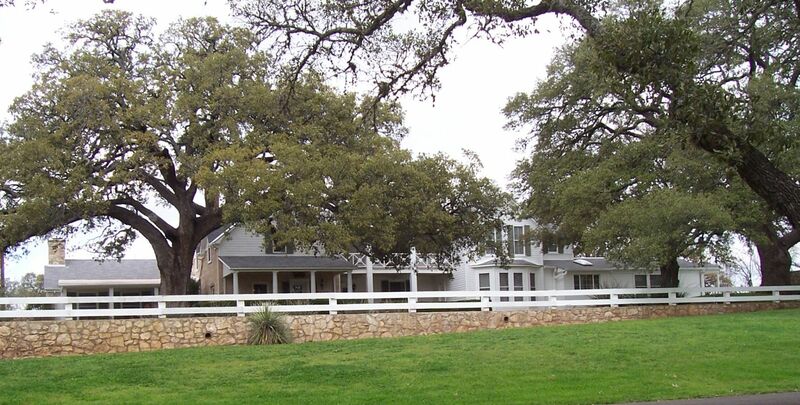 After passing the Sam and Eliza Johnson home, the tour turns north into the actual LBJ ranch. The road heads north for about one and a half miles, loops, then returns south. 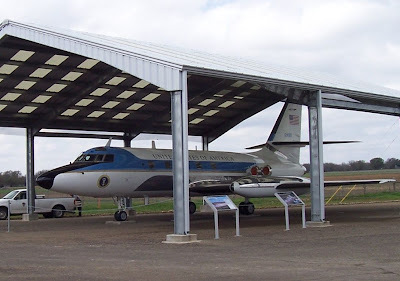 Actually, the road simply loops the landing strip where Air-Force One-Half (as LBJ nicknamed the 13-seat Lockheed Jetstar -- Air Force One was too large to land on the ranch) would land back in the 1960s. 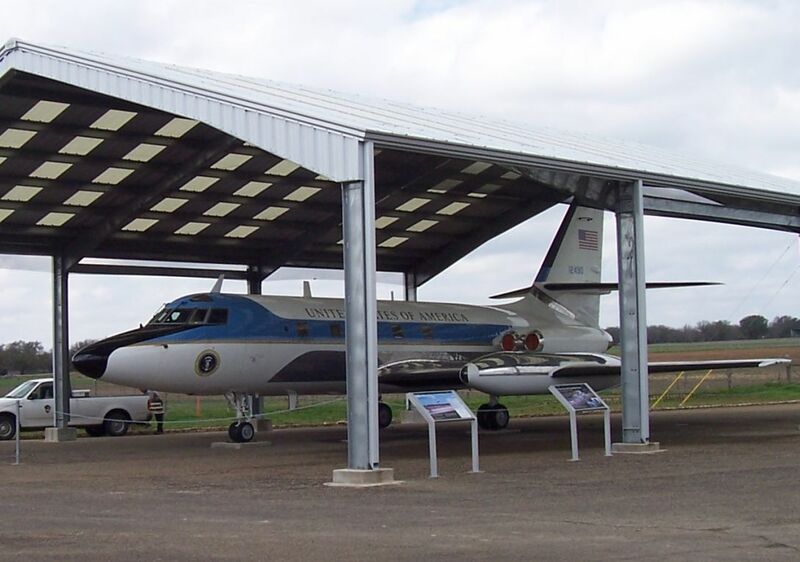 LBJ spent about 25% of his time during the Presidency at the Texas White House, so not only did LBJ land here, but other planes ferrying dignitaries -- both domestic and foreign -- would land here as well. At the hanger, we parked and entered the Visitor Center. Up to now, everything we had done today has been free, but there is a $2 per person fee to tour the ranch house. We gladly paid that nominal amount. A very competent tour guide then led us through the Texas White House, entertaining questions throughout the tour. We were not allowed to take pictures inside the Texas White House, so I have no pictures to show you of the interior. Originally, the house was a single room affair erected from native limestone. LBJ's aunt and uncle bought the house in 1909, then LBJ purchased the house from his aunt in 1951. Over the years, the Johnson's enlarged the house time and time again until today it is 2 stories and about 8,000 square feet. We were only allowed to tour the first floor. It's a unique feeling to know that you are walking where some famous and powerful people walked. I actually felt like we were imposing a bit as we walked through the bedrooms where LBJ and Lady Bird spent their nights. 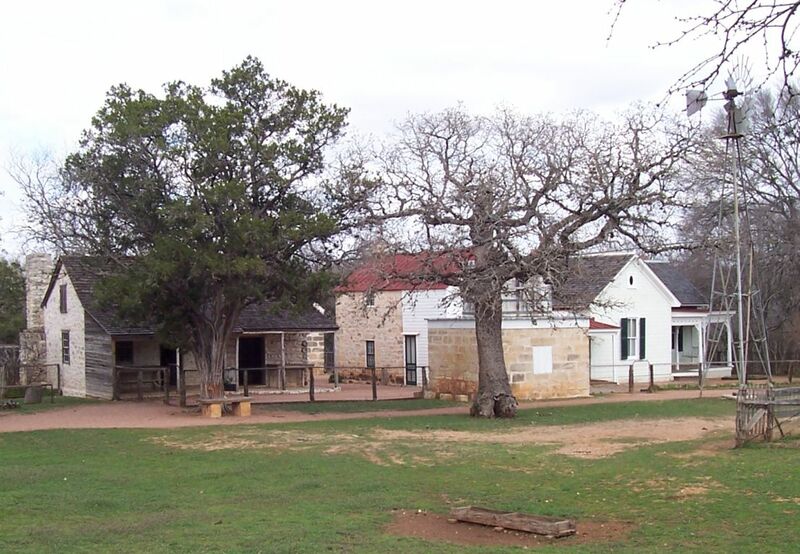 Texas White House; President's office is room on far left; master bedrooms on far right; the part where the porch is under the bow of the oak tree is the original room of the house. I really enjoyed the day we spent learning about LBJ. I admit I'm partial to the late President. Since he was a Texan, I really took an interest in him as a child. His rise to power is such an interesting story.